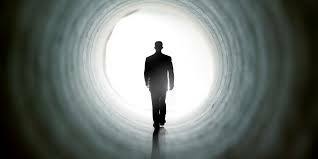 Death … A Philosophical Perspective. Fifteen years of love and devotion were over in just a moment. Tramp had cancer in his stomach and was bleeding into his bowel. All of us except Finlay, who was working, surrounded him and hugged him. As one we cried. My wife held his head and looked into his eyes to reassure him. She wanted her face to be the last thing he saw. He was her special friend. The vet cried with us as he administered the lethal injection. In just a moment Tramp was gone. His soul departed, leaving just the shell that had served as his body for 15 years. But life goes on. I awoke the next day and immediately had to attend a fundraising sausage sizzle at Bunnings. My grief was still raw. I cried as I drove to do do my duty. My youngest son was with me. He and I took time to have breakfast together. Unsurprisingly, given the events of the previous day, the topic of our conversation was death, and in particular euthanasia. My son, who is 14, is pro-euthanasia. He confessed he did not understand how we found it ok to put animals out of their suffering yet kept humans living in pain. It was my son’s view that if a human was in a great deal of pain and was suffering they should be able to die if they so chose. I challenged his view. I wanted to ensure that he considered the issue from different perspectives. I pointed out that allowing euthanasia had many legal dilemmas that were hard to resolve. For example, I argued, there are people that think that if some one is severely disabled they should be allowed to die, or that parents should be allowed to decide if their new born with a disability should receive treatment at birth that might save the child’s life. He was adamant that this should not happen. He strongly believed that all people with a disability should be able to live. I pointed out to him that there might be some people that actually feel that a disability causes too much pain and, therefore, that people with a disability should be able to die. I pointed out that there are actually some people that want to eradicate disability all together. The gist of my message was that before euthanasia could really be legal there were many moral dilemmas that needed to be considered. I can only hope our little discussion assisted him to consider the many different perspectives relating to euthanasia. There are some academics that argue that the state of disability is a lesser state of living. Chief among this brigade is Peter Singer. Singer thinks that disability is a misfortune. Indeed in a paper he has written titled, Ethics and Disability, he repeatedly makes this point. On deafness he states, “And certainly most people all over the world—not just bioethicists—believe that to be un- able to hear is a misfortune..” He makes this point while acknowledging that the Deaf community are unlikely to hold this view. But make no mistake Singer, and people of his ilk, believe that disability is a lesser state of being. They believe that parents should have the right to choose to abort a fetus that is confirmed to have a disability. They try to soften this view by saying it is a matter of choice. By this they mean that it is perfectly alright for parents to decide to take a fetus to full term knowing it has a disability if they so choose. However, they also feel that parents should have the right to abort a fetus that is confirmed as having a disability. Singer encourages parents who know that their unborn child has a disability to talk with disability groups before making a decision. He believes it should be an informed decision, BUT – If the parents still decide to abort the fetus before it goes to full term, because it has a disability, then Singer considers this perfectly acceptable. I find the idea of aborting a fetus because it has a disability very sad. My values do not allow me to accept that a person with a disability has less of a right to live than a person without a disability. My view is that no one should be able to judge the value of life based on an assumption that not having a disability is of more value than having a disability. That’s my strong view but not everyone thinks that way. Singer’s views are controversial but make no mistake there are many, many everyday and perfectly nice people that feel as he does. Indeed Gillian Triggs, the current Human Rights Commissioner, gave birth to a severely disabled child. At birth the doctor advised her to just let the child die. Triggs agreed with the doctor and provided consent for her child to not receive treatment to save its life. But the child did not die. It lived for 21 years. Triggs gave her child up for adoption. She was forever thankful for the family that cared for her child. I wrote about Triggs dilemma in an earlier Rebuttal. Click HERE to revisit this article. I do not want to be critical of Triggs. It was her first experience of disability and the EXPERT doctor had advised her that her child would be better off dead. How does one react to this having just given birth? It must have been horrific. Nevertheless, it clearly shows that our society values people with a disability much less than the non- disabled. Singer puts forward an argument that people with severe disabilities take away resources from the health care system that could be better used to save lives of people who, presumably, have more of a right to live than others. I find such a view totally offensive but Singer is supported by more people than we care to admit. Death really is natures own natural “de-populator“. Arguably death is actually essential and healthy for all species. If nothing died and only bred, there would be no room left on earth. Humans think nothing of culling animals in the wild if they feel there are too many of them. Humans will argue that by culling animals that they are reducing demands on food sources and thus contributing to the survival of a species as a whole. Humans will think nothing of killing several thousand koalas to ensure that they don’t eat themselves out of their habitat. Yet humans cannot relate this concept of “culling” to themselves. As a species Humans put more demands on the environment than any other. They do more damage to the environment than any other species. Humans with the unquenchable thirst to live forever put themselves at risk and other species as well. Despite this humans continue to research how they can live longer and they are succeeding. It is a paradox that by living longer human’s are probably hastening their eventual demise. No one wants to say it but probably of all species that need to die a bit quicker it is us humans. In Japan a Government minister upset people by suggesting that elderly people should be left, “.. to hurry up and die.” He argues that by hastening the death of the elderly then less stress is placed on the state to maintain them. There is an argument that might say that instead of saving lives we should just allow death to happen naturally. In this way the species as a whole, and other species too, can survive longer through placing less stress on the resources of the earth. Deep down we know it’s true but I cannot see too many people volunteering to die without a fight. The instinct for survival in humans is way too strong. Of course this is purely satire but if we are honest we know this is not far from the truth. In the past death through disease and war has had a natural way of culling the human population. Be it the Bubonic Plague, Smallpox, the Spanish Flu or the great wars, death had a natural way to cull the human population. But technology and science has interfered with this natural process and by living we, ironically, might be actually killing ourselves more quickly. Death? We need it far more than we care to admit!